The curved company logo may appear to dominate at the top of the bag, but it works well in the background of a broad flavor color coded area within the main body of the bag. 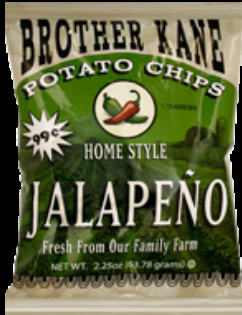 The Jalapeno green should mean that a more user friendly font without serifs, and a smaller uniform (across the range) flavor description was used. The Family Farm image works brilliantly with the company slogan at the foot of the packaging to provide a homely and local feel to a locally distributed product. The Snap Test revealed a light, barely audible sound and it takes a mouthful to get any real crunch going on. As with most thin Potato Chips, these lacked any real bite, featuring instead, a crack rather than a crunch. These Chips seemed a little pale. There were hot oil cooked bubbles on the surface of fairly thin Chips, but little golden essence of potato. The bag included mostly whole constituents, but there didn't seem much to them. There wasn't much, if any seasoning visible and they lacked color and character. They just looked a bit greasy. We wish a Chips manufacturer would have the bravery to label a variety 'Mild' Jalapeno, or at least mix it with another flavor like Sour Cream. If you eat a Jalapeno Pepper you expect an eye watering experience at some stage. This will not happen with Potato Chips. These were no exception. A spicy potato aroma greeted us when the bag was opened and the flavor was similar. There is a nice, mild and easily edible, peppery, spicy flavor. You could eat lots of these and not get bored of the flavor, but it still isn't hot enough to emblazon giant letters across a bag screaming 'Jalapeno'.